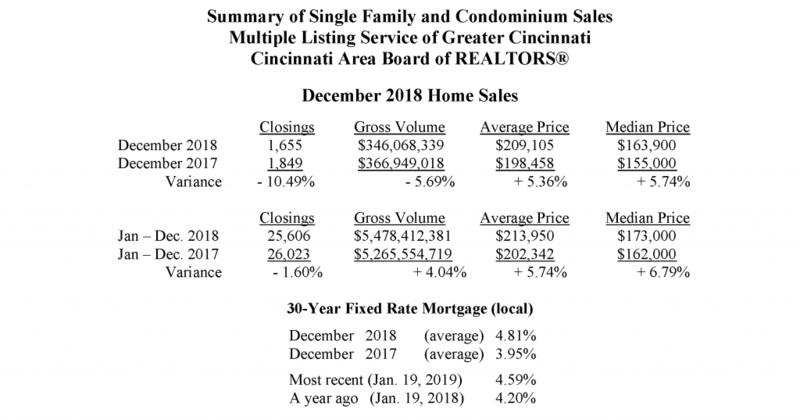 “Despite the slow sales in December 2018 home sales remained one of the top three strongest in over 10 years,” said Michelle Billings, President of the Cincinnati Area Board of REALTORS®. “Even in the winter months, interest rates remain low and there are plenty of buyers. This is a great time to list and sell your property. 2019 looks to be a great year for home sales as well,” said Billings. “Affordable, accessible, attractive. These are just a few terms that best describe Greater Cincinnati and are some of the reasons why the housing inventory is turning over quickly,” said Billings. “In 2018, Cincinnati was among the top 50 on the list of Best Places to Live according to rankings from U.S. News and World Report. They stated that Cincinnati is very affordable, great for job prospects and quality of life. So, if your home is in move-in ready condition and priced reasonably, in today’s market, there is great opportunity for it to sell quickly,” said Billings. Local home mortgage rates in December averaged 4.81% for a 30-year fixed rate loan. The rates were up compared to 3.95% a year ago. At these fixed rates, the monthly principal and interest payment on a $100,000 home loan with no money down would be approximately $525. Nationwide, December home sales were down – 6.4% compared to November on a seasonally adjusted basis and were down – 10.3% from December 2017. CLICK HERE to access a PDF version of this press release.